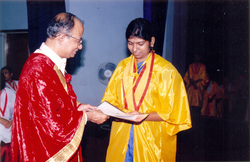 Srivi won the 2nd runner up for her collection of short stories. Her e-book can be downloaded on Oxford Bookstore site or here. "A Pearl! A Costly Pearl! Did you find any?" Srivi's illustrated essay: "What would life be like without fear?" won her second prize in the Royal Commonwealth Essay Competition, the world's oldest global writing prize for young people in 1997. To read the essay, click here. 1998 "Why not be different?"